The root of perennial herbaceous plant Angelica dahurica (Fisch. ex Hoffm.) benth. et Hook. f. or Angelica dahuriea (Fisch. ex Hoffm) Benth. et Hook. f. var. formosana (Boiss.) Shan. et Yuan of family Umbelliferae. The one grown in Henan is usually called Yu Bai Zhi while the one grown in Hebei is called Qi Bai Zhi. Those grown in Zhejiang, Fujian, Sichuan and other places are known as Hang Bai Zhi and Chuan Bai Zhi. Collect it in summer and autumn when the leaves are yellow. Strongly fragrant, pungent, a little bitter. Strong, heavy, richly powdered, strong fragrance. Pungent and warm; lung, stomach and large intestine meridians entered. Expel wind and release exterior, alleviate pain, relieve stuffy nose, dry dampness and stop leucorrhea. Because it has mild effect of dispersing wind-cold as well as alleviating pain and relieving stuffy nose, it is usually used in headache due to external wind-cold or with stuffy nose, running nose symptoms. Constantly it is combined with Qiang Huo, Xi Xin and Chuan Xiong, such as Jiu Wei Qiang Huo Tang in Ci Shi Nan Zhi. In the case of wind-heat external syndrome, it can be combined according to the differentiation to strengthen the effect of expelling wind and alleviating pain. As it has strong effect in relieving pain and enters the yangming stomach meridian of foot, it is constantly used in pain located in forehead, between the supra-orbital ridge and gums. In the case of wind-cold, it can be used singly, such as Du Liang Wan in Bai Yi Xuan Fang (Precisely-selected Prescriptions). It can be more effective combined with wind-expelling and pain-relieving herbs, like Fang Feng and Chuan Xiong, such as Chuan Xiong Cha Tiao San in Tai Ping Hui Min He Ji Ju Fang. In the case of wind-heat, it is often combined wirh wind-expelling and heat-clearing herbs such as Bo He and Ju Hua. When treating arthralgia or traumatic pain, it can help the corresponding herbs strengthen the effect of relieving pain. It can either expel wind, dispel cold, dry dampness in case of sinusitis with purulent discharge due to wind, cold, dampness pathogens or disperse lung and raise yang so that yangming clear qi can nourish nose. Because of its effect of relieving stuffy nose and alleviating pain, it can be used to relieve the symptoms of stuffy and running nose and the pain of forehead. It can either be taken internally or externally by smelling it into nose. It is constantly combined with stuffy nose-relieving herbs like Cang Er Zi and Xin Yi. Because of its effect of drying dampness and astringe leucorrhea, it can be used in women with too much leucorrhea. Because of its warm property, it is constantly combined with heat-clearing and damp-resolving herbs such as Bai Zhu, Shan Yao, Fu Ling in the case of leucorrhea due to cold and dampness. 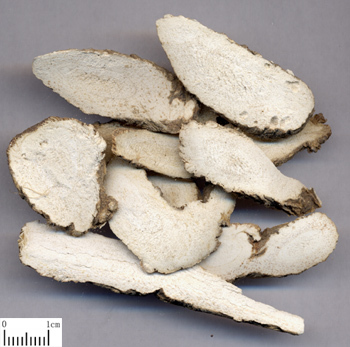 While in the case of serious internal dampness and heat with yellowish and reddish leucorrhea, it is constantly combined with heat-clearing and damp-drying or heat-clearing and damp-resolving herbs such as Huang Bai, Che Qian Zi, with both the effect of heat-clearing and damp-resolving to astringe leucorrhea. In addition, it has the effect of expelling wind and relieving pruritus, and it can be used in cutaneous pruritus. Because of its action in dispelling pathogens, warming and dredging vessels, it can be used in the initial stage of carbuncle to help clear heat and detoxicate to relieve swelling. After the formation of abscess, it can help those qi-tonifying and blood-nourishing herbs to expel pus. Decoct 3~10 g. Proper dosage should be applied for external use. It should be used with cautions for blood heat induced by yin deficiency because of its pungent, fragrant, warm, dry property.